When it rains, trees provide many benefits for the landscape and neighbourhood. Their leaves manage runoff and prevent erosion while their roots allow for good infiltration. Storms, in general, are advantageous for the environment, but when they turn violent, they can have negative impacts on trees. Trees have an intricate root system that is perfect to retain rainwater and, in turn, prevent flooding. When water is low, these reserves act as a resource for trees, as well as wildlife. When rainstorms are coupled with lightning, trees act as attractors and are often killed by fire as a result of being struck or weakened so that they are susceptible to diseases and pest infestations. Since the 1960s, people have become more aware of acid rain and the impacts it has on trees, such as damaging their leaves and needles by wearing their coating away. The trees are, then, weakened and prone to cold weather, insects, and disease. Some types of soil can neutralize the acidity in the rain, but if soil absorbs acidic rain too often, its buffering capabilities diminish. Another way acid rain affects trees is by increasing soil depletion where the acid leaches the nutrients, including potassium and calcium, and washes them away. If this occurrence lasts too long, the soil stops being able to support plant life. 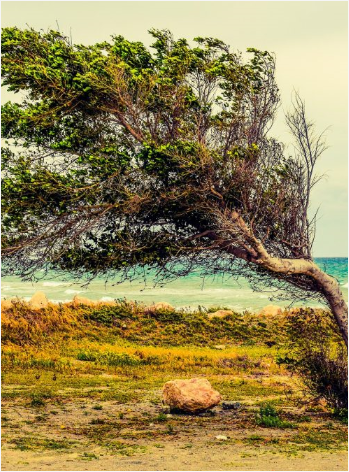 Trees develop a strong resistance to winds—called wind firmness—which makes these types of storms beneficial. Their root system supports the tree by preventing it from bending too far and consequently, breaking or becoming uprooted. Damaged trees are vulnerable to a number of diseases and pests whether it’s from having limbs broken, the trunk debarked, or being completely uprooted. Strained and damaged root systems also suffer because they are exposed to fungi and pests with less capability to handle nutrients or water. When trees become damaged, it can lead to costly repairs as well as pose risks to homeowners because of where the trees collapse, such as in your pool, on your home’s roof, on power lines, or in your home itself. Maintaining a neat and healthy yard reduces disease, pests, and damage. By clearing away fallen debris after storms, you will have the situation in hand. By pairing this will regular trimming and monitoring, you will help your trees become stronger and lessen their vulnerability with proper care. If your trees have endured a storm, contact Rock’s Tree Service today so we can provide efficient tree removal and stump grinding services to make your yard feel like home again!